Dallas, TX — On Sunday, activists rallied around the Dallas Cowboy’s stadium to draw attention to the slaying of Botham Jean. They carried coffins and blocked traffic to expose the special treatment of Amber Guyger, the cop who has yet to even be fired for killing Jean. Now, as more details emerge, this special treatment has moved to a level that is even more insidious. From the beginning of this case, it was clear that Guyger was receiving special treatment from law enforcement. One of the most glaring instances showing her privilege was the fact that the Texas Rangers said in their report that Jean refused to obey Guyger’s “verbal commands.” Had anyone else but a cop walked into an apartment and killed an innocent man, do you believe that investigators would have said anything like this? What’s more, according to WFAA, who obtained affidavits for all of the search warrants involved in the case, none of them involved the search of Guyger’s apartment. For those who don’t recall, police egregiously released the search warrant findings of Jean’s apartment on the day his family buried his dead body. They attempted to assassinate Jean’s character by claiming they found less than a half ounce of weed in his apartment. However, they failed miserably at it. One thing in particular, however, stood out to those paying attention and that is the fact the police didn’t release any information on what they found in Guyger’s apartment. According to the information currently available, that’s because they didn’t search it. Two of the warrants allowed investigators to remove the front door of Guyger and Jean’s apartment, their door locks and to download data for their door locks. An inventory return states that they removed both of their door lock and downloaded the data from the door locks. A third search warrant gave investigators the authority to enter Jean’s apartment and collect additional evidence. A return shows that investigators took photographs of his apartment, made videos of his apartment, conducted “laser measurements of firearm trajectory,” and collected “gunshot residue” from the door frame and kitchen wall of Jean’s apartment. A return for the fourth search warrant shows investigators seized video from the surveillance camera system in the apartment management’s office. A fifth search warrant gave investigators the authority to obtain all communications related to the incident in the possession of property management, as well as all surveillance video and all entry and access logs from 9 p.m. to 11 p.m. on the night of the shooting. An inventory return shows investigators seized a USB drive containing the video, an event log report for “linear access doors and gates,” an “elevator access door lock” report and a “lock audit report for both apartments. A manager at the complex declined to indicate exactly when Guyger moved out and if she left the premises voluntarily, the Dallas Morning News reports. 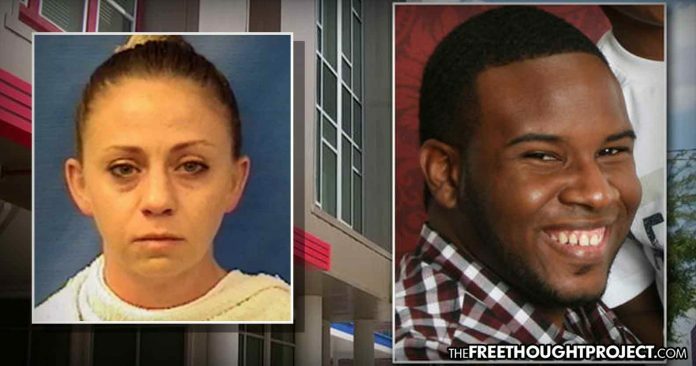 While residents can certainly sleep better knowing that they don’t have to fear a killer cop walking into their apartment and murdering them, the family of Botham Jean likely sees this as one more instance of injustice.